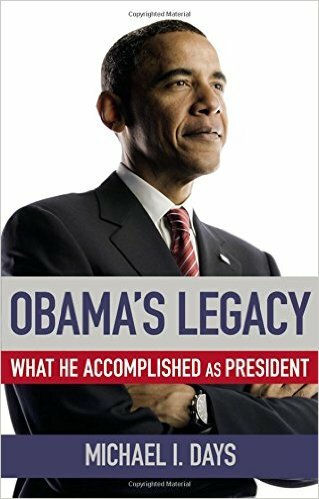 Life and Times of Alex Esguerra: Barack Obama's Legacy as he winds down his "Yes We Can"
Obama's Legacy: What He Accomplished as President hardcover book was released right after 9/11's historic day on 9/13/2016. Written by Michael I. Days who is an editor of the Philadelphia Daily News. Philadelphia was one of the turn around states on the recent US presidential elections which Obama won in 2008 and again Hillary's magnanimous campaign did not persist seeing high wins of newly elected US President Donald Trump. Michael Days showed how Obama surpassed the Greatest Recession of Modern Time in 2008. President Obama the first African American in US Presidents is credited as having the biggest lifeline of job growth in all US Presidents, two thirds reduction in the federal budget deficit and how he revitalized the greatest slow and record numbers of the stock market. As any sitting president, the greatest challenge is the lack of cooperation of the US Congress, a scenario that President Elect Donald Trump has not seen yet. After his inauguration this January 20, 2017 starts his new life as president politician entirely different from the scope of doing business as an business person. This book on Obama writes " Through it all, the President who campaigned a slogan of "Yes We Can!" has persevered in his determination to make a difference and left an indelible mark on American politics and the world". Days continued is stating LEGACY is a commemoration of his eight years in the White House. One of the remarkable things Obama started off after taking office was implementing the auto industry rescue plan that saved almost 1 million jobs in GM and the like. General Motors in turn retrieved it's glory as the premier car company in the globe. Hence this year, GM reach enormous profits it gave one share of profits to every GM worker with individual checks to a tune of US$11,000. Obama also signed the American Jobs and Closing Tax Loopholes Act, closing many of the loopholes that allowed corporations to send jobs overseas and avoidance in paying US taxes by moving money overseas/offshore. This is one particular policy that is going to be scrutinized by the new incoming administration when the new president starts his slogan of "Making America Great Again". Another on the watch list is the "Patient Protection and Affordable Care Act" where the health sectors inflation had tremendous ceiling drops in 50 years. Nevertheless, Trump and the Republican controlled Congress vowed this to be repealed. In August of 2011, the NLRB or National Labor Relations Board issued a final rule under Obama's directive requiring employers to notify employees of their rights under the National Labor Relations Act of Nov. 14, 2011. The notice states that employees have a right to act together to improve wages and working conditions, to form, to join and assist a union, to bargain collectively with their employer, and to refrain from any of these activities. Examples of unlawful employer and union conduct and instructs employees how to contact the NLRB with questions or complaints. Thus, the current White House has the historical library of policies and enactments of Obama. It is fair to note that Obama had also repealed some of the policies of then George W. Bush when he took office. So it just justifies the plans for newly elected President Trump that he plans to revisit and repeal some of Obama's policies. Over the years in business, seeing politicians and or working through inter government projects of an ensuing administration, I can say that politicians always have a signature policy they want to accomplish, be known for, leave history and may or not continue the previous policies of the former administration. But it is also fair to say that every political figure including US Presidents that their main goal is to improve the lives of the citizens they were elected by. Hence on January 20, 2017 as we watched the traditional setting off of US President Barack Obama, the first black president in US history in Marine One, we can simply say, "Thank you President Obama" till we meet Citizen Obama.